The use of motorized boats and other motorized watercraft is prohibited along that portion of the Lardeau River contained within Goat Range Park. This prohibition is made pursuant to Section 3 of the Park Act, and is necessary for the protection of the critical fish spawning and rearing areas and other sensitive habitat along the Lardeau River corridor within the park. This prohibition applies from the outlet of the Lardeau River on Trout Lake at Gerrard to the park boundary approximately 14 km downstream near the confluence of Poplar Creek. Please see attached map for more details [PDF]. This park protects the only natural spawning site of the unique “Gerrard” rainbow trout. This wilderness area is critical in maintaining the natural habitat for species such as grizzly bear, mountain goat and mountain caribou. Visitors are asked to employ low impact techniques. Campfires are not allowed except in emergency situations. History: The park has an important mining and logging history including a historic townsite and railway station, although no trace of these remain. 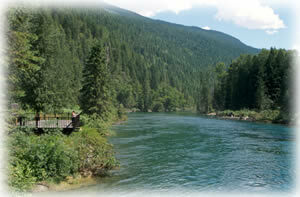 Cultural Heritage: The area within the park is significant to the Okanagan, Shuswap and Ktunaxa-kinbasket First Nations. The park has an important mining and logging history including a historic townsite and railway terminus at the south end of Trout Lake. Conservation: This wilderness park protects a mix of low, mid and high-elevation forests. The park contains old-growth forests, extensive alpine meadows and lakes, and numerous rivers and creeks. It provides a spawning and rearing habitat for the internationally important Gerrard rainbow trout and an important spawning channel for Kootenay Lake kokanee in the Meadow Creek watershed. Flowers, trees and shrubs are part of the park’s natural heritage, please do not damage or remove them. Wildlife: This wilderness area is critical in maintaining the natural habitat for species such as grizzly bear, elk, mountain goat and mountain caribou. The approved Goat Range Provincial Park Management Plan [PDF 1.48MB] is available online in pdf format. Bicycles must keep to roadways. Bicycle helmets are mandatory in British Columbia. No mountain biking trails. This park protects the only natural spawning site of the unique “Gerrard” rainbow trout and is an important spawning channel for Kootenay Lake kokanee in the Meadow Creek watershed. These important habitats are closed for fishing due to conservation reasons. Anyone fishing or angling in British Columbia must have an appropriate licence. This park has some rugged possibilites but few developed trails. There is one short but awesome old growth cedar walking trail, and one short hike to a spectacular waterfall. For your own safety and the preservation of the park, obey posted signs and keep to designated trails. Shortcutting trails destroys plant life and soil structure. Wilderness, backcountry walk-in camping is provided, but no facilities are provided. There are no user fees charged at this time.